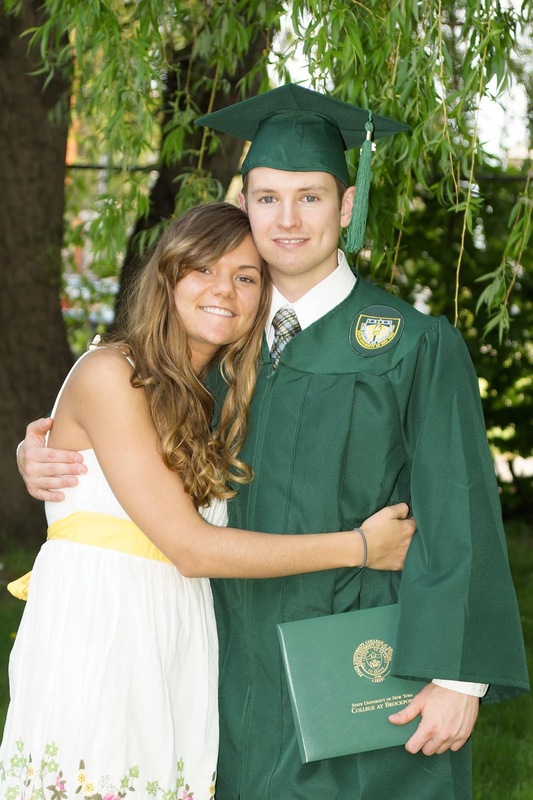 A photo of Alec and I after his graduation, taken in the back yard of our first apartment. First of all, I want to say Thank You to everyone that read and commented on my heartfelt, venting post last night. Your encouragement means the world to me and I'm so glad to have you all as readers. Unfortunately, I switched back to blogger comments because I was sick of Google+ not letting people comment unless they had google accounts. This means that all of the comments I have received while using Google+ have disappeared. (sad face). Sometimes I just sit here and start writing and begin to think that nobody will really care how my day at the lake was. Turns out, that is what blogging is all about. Lifestyle blogging, especially. Sew, I'll keep on keepin' on. I'm glad you like my completely random post topics because the thought of narrowing my blog content down to one type of hobby just makes me cringe. I've got far to many interests for that. Now on to say how very fast summer is moving along. Can you believe it is already August? I'm sure this is how ever July wrap up post begins, though. My favorite part about August is that it is my birthday month. I'm turning 20 this year. The big two-oh. Kissing my teenage years goodbye (and good riddance). I've learned a lot and I'm ready to learn more. Everything is really coming to a clean closure at the end of this month. First of all, Alec finally got a job! Today is Monday. On Mondays I post my Menu for the week. I am feeling rather discouraged on this menu ordeal and have been dreading "Monday's Menu". Does anyone actually read these menus of mine or does the sight of another round of "Monday's Menu" make you keep scrolling? These are the thoughts I've been having lately and I don't like them. I absolutely love blogging and thought I'd be a lot farther ahead in blog land by now than I actually am. I've been blogging for almost 3 years, people. I picked up this lovely little book in a local antique store. I have been drawn to antique books for the past few years, especially cook books. My book has no sleeve and is decorated with a simple blue hardcover. It only cost $4, too. What a steal. It is listed on Amazon for $20. When I opened this one to find out it was organized by months I was particularly excited, because that is my favorite kind of recipe book. The ones that take you through an entire year in someone else's shoes, showing their family traditions and recipes for every season. This book was written in 1952 and shares everything from traditional Amish recipes to Pennsylvania Dutch superstitions. Ann Hark gives a delightful look into a slower pace life, where one can hop in the car and head through the country side at a moment's notice. Her descriptions make it seem as if you were smelling fresh bread yourself or feeling the chill air of the night of Christmas eve. She does not simply hand out the recipes, she shares the whole story of the day she tasted the first recipe and who she got it from. I do recommend this book, although there were far less recipes than I had wished in it. It was much more a fascinating story than a recipe book. I'm dying to try the apple fritter recipe on page 62! This is just a picture of a precious little chipmunk I found last month. I was recently nominated by my dear friend Wendy from Effie Girl for this sweet little award. I almost didn't do this post because I have so many things on my to-do list before work this morning and I told myself that I will only blog until my coffee cup runs empty! Then, I thought, I would get up and get cleaning. When I saw this nomination, read Wendy's post and the posts of her nominees, I strolled into the kitchen and refilled my coffee mug. Whoops. Oh well. This is a good chance for any new followers to learn a little bit more about me. I'll answer 11 questions from Wendy about myself and state 11 facts, then I create 11 questions for the people who I nominate to answer. The only rule is that the blogs you nominate have to have less than 200 followers. It is just a little way for us micro bloggers to find some more friends, right? This week we are eating lots of beef. I do not know why we picked out so many meals with beef in them this week, but I don't mind too much. We are leaning towards summer foods during these hot days. Last week I made a huge pasta salad and we ate it every day. We also made chicken and vegetable kebabs. Delish. What foods are you eating to stay cool? Complete with re-fried beans, olives, jalapenos, taco sauce, lettuce, tomato, onions and taco beef. We love tacos. Yesterday after a motorcycle ride, we discovered that the farmers market sets up one street over from our apartment every Sunday! I was very excited to get my hands on some local produce and we left with some sweet corn, peaches and fresh lettuce. I love corn on the cob in the summer. But then again, who doesn't? If you have never heard of one of these please read this article about this prime "Extreme American Cuisine" local to Rochester. You pile home fries or french fries onto a plate, top with hamburgers and hot dogs, mac salad, ketchup, mustard and hot sauce. Then, you stir it all up and eat it. Sounds gross, but it is actually delicious. My man loves to eat these things so, I figured we could make it this week! This is more for Alec than for me. I am picky about my chicken and will most likely eat a grilled cheese or something instead. Using up some of our pasta that we have sitting around. It has been a few weeks since we had pasta, anyway. Alec's real favorite. Not mine. He has been eating them all yesterday and today, anyway. Alright, people. This post has two completely unrelated topics in the title. You probably read the post title and clicked it out of sheer curiosity as to how these terms were related. The only thing relating these topics is my bucket list of 40 things to do before I turn 20. You are probably sick of hearing about this list of mine by now. Or maybe you are enjoying watching me attempt to finish a seemingly unending list of goals. Either way, read on! On Monday Alec and I packed up our backpack and headed for the nearest beach. I had to work at 5 pm, but it was too gorgeous out to stay inside all day. So, we laced up our sneakers, packed our water shoes, and hoped to have a beautiful day in nature. Lake Ontario is absolutely ginormous. It feels as if you are standing on the edge of the ocean. This was our favorite spot. It was shady, away from all the people and offered a breath taking view of the shore line. Our second favorite place was this "pier" because when we stood out at the end of this strip we could really enjoy being surrounded by the water. There were no screaming kids, no distractions, no cell phone service...just relaxation. I tried some yoga poses, too. This was pretty challenging considering the center of this cement was a hole. It was almost unbearably hot out on Monday (and the rest of this week) so I had to switch my hair into the top knot. I'm reading about the park in this picture. Apparently, during the Great Depression tons of jobs were created as men helped to build this park. There were so many geese at the beach. We started off trying to ovoid stepping in poop, but gave up very quickly when we found there was no escaping it. When we finally found some more shade we had a very brief picnic lunch. This was one of my goals to do before I turn 20 next month. There were so many bugs in the shade attacking us that we couldn't really sit down or stay here too long to eat. After lunch, we entered this trail in the woods in hopes of getting to go for a little hike. Turns out the trail was right next to a swamp. Our sweat drenched bodies, the rain we have been having lately and the humidity should have been enough warnings not to go into the woods. We ended up being so swarmed by bugs that we had to brisk walk while waving our arms over our heads the entire time. We rushed towards the nearest exit out of the trails only to find that the bridge was closed. We had already been bitten a few times and were still being SWARMED by tons of biting bugs, not just mosquitoes. So, we just made a run for it. Mind you, I never run. I just started sprinting with the backpack on and waving my arms above my head, Alec laughing at me and doing the same thing. We passed a group of girls in sundresses on our way out, they probably thought we were crazy. Not as crazy as we thought they were for trying to go into those woods dressed like that, though. We finally made it out alive and learned our lesson. I can't wait to put that story in our scrapbook. Remember that delicious blueberry scone recipe that Mia from Earl Gray Days guest posted about earlier in the week? Well, I am posting Monday's Menu today over on her blog and doing a special "College Cuisine" edition. Please head over there and check out my post and her beautiful little blog. You won't be sorry! Everyone has their own family recipes that are near and dear to their heart. It may be your Grandmother's apple pie or your Dad's pancakes. Whatever your family recipes may be, they deserve to be kept safe and stored in such a way that you can get to them when you are craving them. Most importantly, these recipes need to be kept together so that, when the time comes, you can pass them on to your loved ones as they begin to cook in kitchens of their own. That is why I created my own recipe book a few years back. Here is my first post about it and this post shares a recipe book I made in 4th grade! I've clearly been passionate about this for a while now. My homemade recipe book has brought me so much joy. I love spending the time to decorate each page and getting to glue my grandmother's own recipe card with her handwriting into it, too. Knowing that I have this little collection of family recipes makes me feel like I have something special, and that is something that every 20 something girl should get to have. If you have been following along for a bit, you know that I'm working on completing my goal list of 40 things to do before I turn 20. Why in the world I would want to try to finish 40 goals in a little over a year, while working and going to nursing school, is beyond me. I am not one to give up, so I've been trudging through this goal list and working like crazy to complete the items on said list. Last week I realized that I'm almost 20. This scared me because I know I am nowhere near finished with this huge list of mine. So, I got out my handy dandy planner and started scheduling when I would do each goal and when I would post about it. Turns out, in order to finish in time, I have to finish and post about 4-5 goals per week. Yikes. Did I mention I still have to work, and clean the apartment, and make dinner and sleep...this doesn't leave much time for goal finishing. I'm determined to finish this list, though. All of this introduction is really just as disclaimer...a warning, if I may. I will be posting lots and lots over the next few weeks. They won't be boring posts. You might actually find them entertaining..or inspiring. Maybe you will create your very own list of goals to complete before your next birthday. There is one thing that is great about this list and that is all of the fun things it forces you to do. If I didn't come up with this list of things I wanted to accomplish before leaving my teenage years, I would be sitting here reading blogs all day...not doing activities that allow me to experience life and to grow as a person. Overall, it is crunch time for me. Hence this post: A weekend trip with my mother to "The Amish Mall" and getting to sneaking in to pet a cow. Two more goals checked off my list. "The Amish Mall" is not for the faint of heart. Only true antique lovers and thrift shoppers should involve themselves in such a place. If the country side makes you a little uneasy, you might as well just stick to the shopping mall. Today a dear blogging friend of mine is sharing her recipe for delicious, blueberry scones with us. 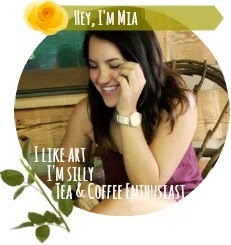 I fell in love with Mia's blog, Earl Grey Days, the minute I found it. She is about my age and is in her second year of college, like me. Her blog is about her journey through school and beyond and a place to share what she is learning along the way. If anyone is familiar with my blogging purpose (see left side bar), they will see some real similarities between our two blogs. She even fancies the same pale pink headings that I do for blog posts. I hope you enjoy her writing as much as I do. Head over to her blog for delicious recipes like these French Breakfast Muffins and much more. "Earl Grey Days was inspired by my love of tea, rhyming, and those sweet, calm, grey days that inspire us all. " This week Alec sat down and wrote out the recipes that we will make. I usually make the menu and pick recipes that I know Alec will eat...or at least try. Last week's tuna noodle casserole was something he has never had before (can you believe it?). He ended up loving it, though. If you menu plan and want to see what a week of dinners would look like from your man's point of view, let them do the planning this week! I love to sew and love to read. I've seen a few posts about fabric book covers and have been inspired to make my own. Like Little Miss Shabby's journal cover , Craftionary's tutorial, and especially this post by Two Hippos! This simple book cover didn't take long at all to create and is a great way to use up your fabric scraps. If you are anything like me, you have a lot of them. I have been reading old cook books lately. Cook books that were written in the 1950's and are told like a story are my favorite. I picked up "Blue Hills and Shoofly Pie" at a local antique store for $4! I am deeply in love with the plain, hard covers. The way they look all stacked together makes me love my old book collection even more (if that is even possible). I do love how this fabric book cover turned out, though. This would be great to cover a journal or to protect recipe book covers when working in the kitchen, too! Do you ever find a part in your book that you want to flip back to? This happens to me all the time, especially when there are recipes involved. So, I sewed up some mini book marks to leave in the books to mark my favorite parts or recipes that I'd like to flip back to. This is a cute alternative to folding the corner of the page over. I created both of these little projects in under two hours. Well, just take a look for yourself. I've never made homemade strawberry jam before. Well, I did once. I helped my mom make it years ago and barely remembered anything about it. I never grew up eating homemade jam every summer or anything like that. I've always wanted to, though. I'm all about homemade. If you know me at all, you know I'm just dying to figure out how to make anything and everything on my own. From clothes to condiments, I try to recreate recipes and patterns on my own. Strawberry jam is a great place to start when it comes to canning. So, my mother and I spent an evening in the kitchen together (which rarely happens, might I add) and ended up making some delicious jam and more importantly some memories. It is quite a beautiful process if you ask me. This morning I flipped through my recipe books until I found a few different recipes to this weeks menu. I've been craving some meatloaf and was in search for the best recipe. There are tons of variations out there. Some use bread crumbs, others use crackers. Some people bake their loaf on a baking sheet inside a roasting pan, others use a loaf pan. After some research and help from family and friends, I found a few recipes I'm going to combine and try this week. What is your favorite meatloaf recipe?